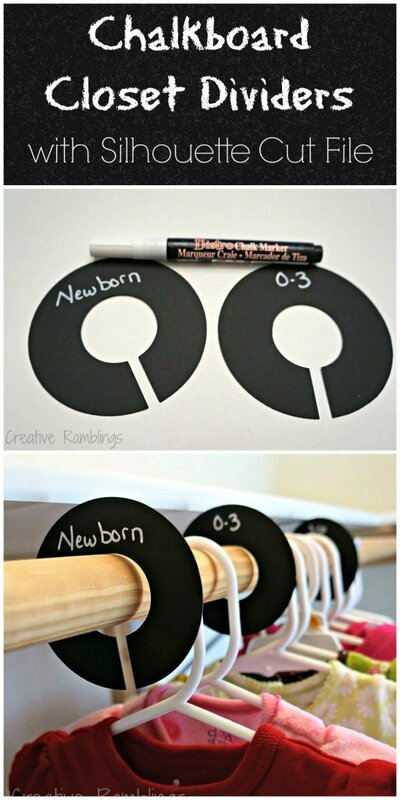 Get those baby clothes organized and be ready for the next size with these nursery closet dividers. 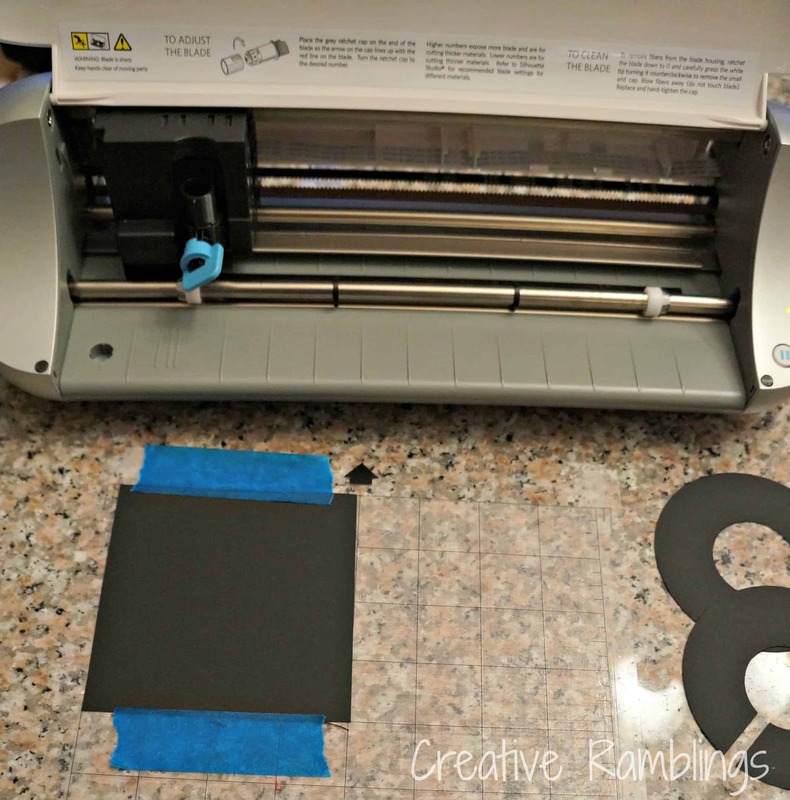 Update: Learn how to cut reusable chalkboard dividers or print and cut themed closet dividers. Get all the options below. With kids, you know how quickly they grow and if you are not careful and organized they outgrow an outfit before you even have a chance to take the tags off. When Little Lady was born we were in an old hose with tiny closets. You can see how I organized her closet here. I had room for her current size, a few bigger items toward the back of the hanging bar, and the next size of clothes in clear bins on the floor. It worked really well, but I still missed outfits, out of sight out of mind. This time around we have much bigger closets (this baby has a walk in closet!). I plan on keeping a couple sizes of those cute outfits in plain sight. I fold and store onesies, pants, and PJ’s; everything else can go on hangers. To keep this all organized I made a couple hanging dividers, the kind you might find at a department store. 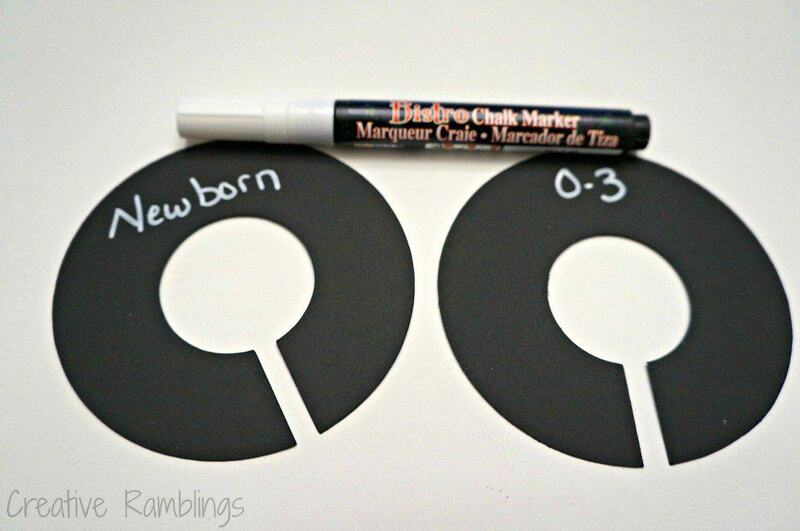 I used chalkboard cardstock for this project, this is a great pack of chalkboard paper that will make 24 dividers! This is very thick, like a heavy cover stock or chipboard. It won’t bend or flop over when hanging. Some chalkboard paper is just regular cardstock with the look of a chalkboard, it cannot be written on. I used my Silhouette to cut the shape. To do this measure your rod, mine is 1.5 inches. Then measure the width around your rod. I have about 3.5 inches around to clear the shelf above the rod. 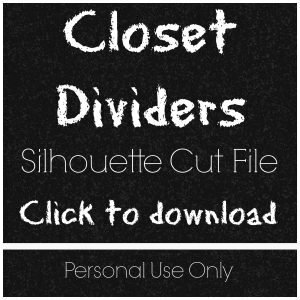 I have provided a cut file below using dimensions that work for me and should work for most standard closets. A few tips on cutting this paper. It is very thick and does not stick well to the cutting mat. I tried a number of different speed and blade settings and finally came up with a speed of 1, blade at 10, thickness of 33, and a double cut. I also used some painter’s tape to help secure my paper to the mat. The beauty of this chalkboard paper is I only need to cut 3 dividers. As baby girl grows I can retire the smaller sizes, add bigger ones, and just erase and write new sizes. I prefer to use a chalk marker on chalkboard surfaces. I use it on my menu board every week, I am able to get more detailed and not have dust everywhere. I use this Uchida of America Fine Point Chalk Marker from Amazon, and it wipes off with a damp cloth. 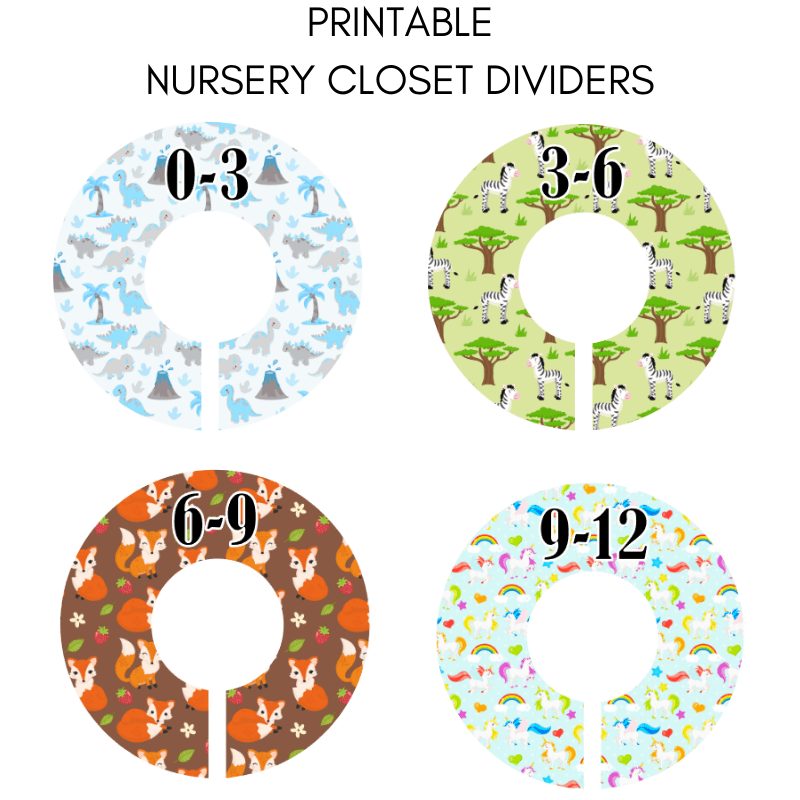 Try these themed nursery closet dividers. 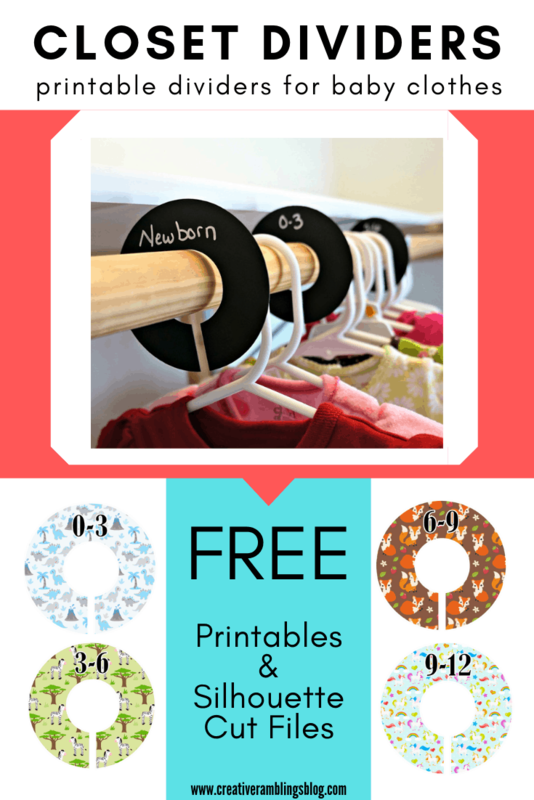 4 themes to fit your nursery with the sizes already printed on them. Chose a PDF file you can print and cut by hand, or download the Silhouette ffile and use the print and cut function. Want some more organizing ideas using your Silhouette? Take a look at the projects below, courtesy of my Silhouette Challenge buddies, for a wealth of inspiration. 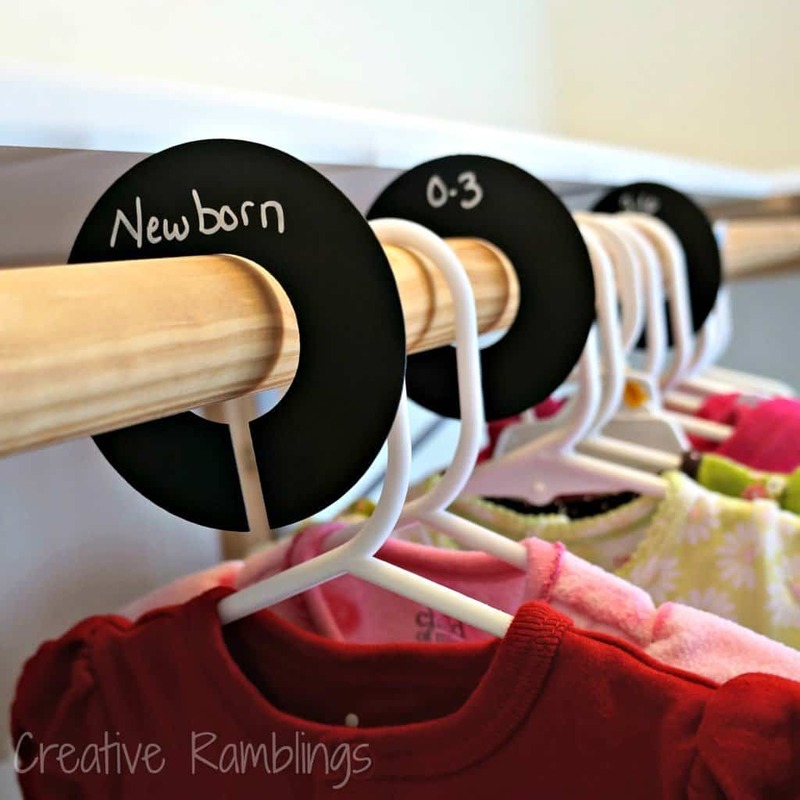 What a great idea for clothing organization! Can I just say I’m in love with the way those markers look against the black chalkboard material? It’s such a little detail, but it really makes a world of difference! Thanks so much for sharing! Thanks Kristy, I totally agree. Love how crisp and sharp it looks! Oh love that idea, I really want to get my closet organized this summer. I may do that! Thanks for visiting. Love this! I wish I had these when my twins were little–it might have made that crazy time a little more sane! Every little thing helps. We’ll see if I can keep it up when the little one arrives. 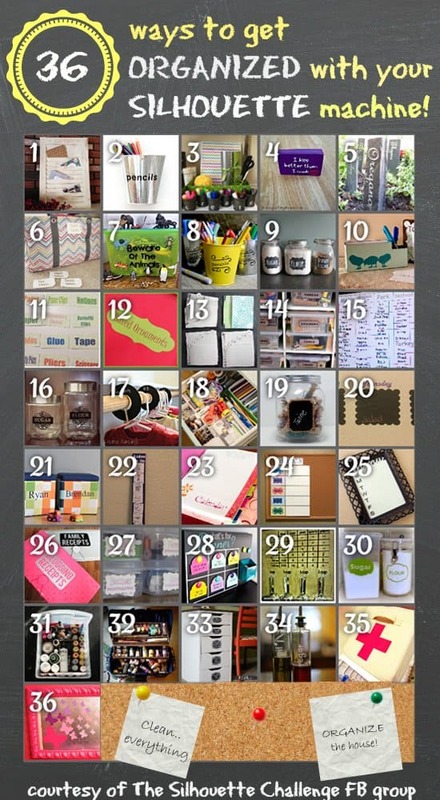 Love this idea and I’m sure going to check out the paper at Michaels. Thanks for the cut file. What a great way to keep organized. They grow so fast….enjoy every minute!! Thanks Tanya, glad you stopped by. I love this idea! Now I just need to convince my husband to actually put the clothes away in the right section! Oh isn’t that the challenge Krista! Thanks. I’ve seen these nifty gadgets for sale but for whatever reason, I NEVER thought to make them myself! I just couldn’t justify spending money on them, but now I’ll be so happy! I’m so excited to get the upcoming baby’s nursery organized! That’s great Janice, I’ve seen them before as well but this is a much more economical way to go about it. Best of luck with baby, and have fun getting the nursery ready. Sarah, This is an inspired idea. I admire how organised you are – all the best for when the new bub arrives. Thank you so much, I hope it stays as organized as it is now! Great creative dividers! I wish I had these when my girls were little! Thanks for linking to the Weekend re-Treat Link Party! xo, S.
Thanks Shannon, happy to link up! Love these! Such a great way to make sure you don’t miss an outfit! I hate it when I find something that my little guy could have worn but never did bc I wasn’t organized enough! My feelings exactly Shelly! Thanks for visiting. I’m lifting this idea for my new great-granddaughter. What a great idea. Thanks Lynne, and please do! Congrats on the new addition. Sarah, this is a great idea! I could use this in my son’s closet for sure. Currently, I’ve got the clothes divided kind of like this, but just using the metal pieces that are part of the closet construction as my dividers. These sure are more attractive and helpful. Tweeting! Aww, thanks Jelli. Kuddos to you for already having it organized. Thanks for the tweet. account. I look forward to new updates andd will share this sitee withh my Facebook group. Thank you for the cut file. I was just about to design my own when I came across your blog. Thanks again! I am so glad you can use it. We’re still using them a year later and I love the organization in my baby’s closet.